The most common cause of the injuries was blunt trauma, followed by injury from a sharp object. high pressure injuries (grease and paint guns). The symptoms of hand injuries can vary depending on the type of injury, how the injury occurred (mechanism), depth, severity, and location. Anyone with a hand injury should consider calling a doctor or seek medical attention. The potential for devastating injuries increases greatly when medical attention is delayed. Even the smallest cut or seemingly innocent hand injury could require advanced treatment to prevent infection or significant loss of function. Any cut or laceration, which may require stitches to repair, warrants a medical evaluation. If a person is in doubt about whether the cut they have needs stitches, they should call the doctor for guidance. Minor burns do not require immediate medical evaluation; however, call a health care professional if there is any doubt. Injuries to the hand causing the following symptoms generally require emergency medical attention at a hospital's emergency department. Fractures, dislocations, high pressure injuries, and amputations require immediate care. Any deep, gaping (open), or dirty cut requires prompt medical care. Wounds due to an animal or human bite (including lacerations from striking a tooth during an assault), because a rapidly progressing infection may occur. Burns: if the skin is disrupted or if the burn goes completely around a finger, hand, or wrist, seek immediate medical care. Upon arriving at the emergency department or clinic, the medical evaluation may include a medical history and physical examination. The doctor may order X-rays after the history and physical exam, if warranted. Certain hand injuries will require X-rays to identify fractures or dislocations or to rule out foreign bodies. After a thorough evaluation, the diagnosis usually falls within one of these common injury categories. Home care for hand injuries initially involves proper first aid techniques. In most cases, serious hand injuries will require medical attention. Apply pressure to the wound to stop bleeding. If possible, wash dirt or debris from the wound. Cover the wound to prevent further contamination or injury. Do not remove large foreign bodies such as nails, hooks, or knives. Immobilize or splint the hand, if possible. Cover the injury if bone is exposed (open fracture), with a clean towel, cloth, or gauze. Ice may help decrease the pain, but never apply ice for more than 20 minutes at one time, and never apply ice directly to skin. Cover the injury with a damp bandage, if possible. Elevate the hand above the heart to reduce bleeding. Retrieve the amputated body part (if possible). If possible, cover the amputated body part, keep it damp, and place the part (for example, finger or thumb) near ice to cool. Do not place body part in direct contact with ice in order to prevent freezing. Keep the injury clean and dry. Thermal (heat) burn: Cool with water, not ice, and then cover the injury. Chemical burn: Irrigate with lots of water, then cover the injury. Frostbite: Rewarm with warm-water bath or soak, then cover the injury. A general sequence of treatment for hand injuries is listed for each type of injury. Many types of injuries can lead to compartment syndrome. Compartment syndrome is a condition in which there is swelling and an increase in pressure within a limited space (a compartment) that presses on and compromises blood vessels, nerves, and/or tendons that run through that compartment; and thus may cause death of all tissue in the compartment and other distal tissue. Although each digit has eight compartments, the syndrome rarely occurs in the hands, but should be kept in mind as a possible complication of hand injury. Hand wounds that have not been treated prior to six to eight hours after initial injury may not need sutures. Many health care professionals leave these wounds open since they are sutured (closed) they are more prone to infection. Internal damage: Lacerations that involve tendons can be treated at a later date by a hand surgeon with positive results. Therefore, an emergency department doctor may clean and close a hand laceration, then recommend tendon repair to a specialist at a later date. Deep cuts: Some injuries require immediate treatment in the emergency department or surgically repaired. When an injury to an artery is diagnosed, a surgeon must evaluate for immediate surgical repair. If a large artery is cut, there is the possibility of massive blood loss. Death may result if bleeding is not controlled. Bites: The main complication of bite wounds is infection. To help prevent infection bites (human bites or animal bites) require thorough cleansing and irrigation (washing out the wound). Puncture wounds (such as cat bites) and wounds where tissue is crushed (such as human bites and dog bites) are particularly likely to become infected. The risk of infection increases when these wounds are stitched closed, so most bite wounds need to be allowed to heal without stitches. The doctor may decide to loosely stitch large bite wounds. Most bite wounds require antibiotics and close follow-up to assure healing. A common cause of a human bite wound is a fight in which a punch results in a cut on the hand caused by striking the opponent's teeth. When this "fight bite" is over a joint (usually the knuckle), cleaning the joint in the operating room may be necessary. This type of injury may appear minor, but can lead to severe infections with significant deformity or disability, even when appropriately treated. Consulting an orthopedic hand surgeon promptly about such bite wounds may benefit the patient. Some hand lacerations are self-inflicted. After wound treatment, these patients should be referred to a psychiatric specialist. If there is no fracture or associated laceration, reduction to put bone back in place is attempted; reduced reduction of bones is painful, so some patients will require pain medication for the procedure. Follow-up with hand surgeon or orthopedist, usually within 24-48 hours. Dislocations are the result of injuries to the ligaments around joints. In a dislocation, a bone is displaced out of normal position resulting in obvious deformity, pain, and decreased mobility. When a dislocation occurs, the doctor will evaluate the injury to ensure there are no fractures. Dislocated bones must be put back in place. This process is called reduction, which is the realignment of dislocated or broken bones. Reduction can be accomplished by external manipulation of the injured area (closed reduction) or by surgery (open reduction). All require follow-up care after a period of immobilization, usually with a splint or cast. The goal of treatment is to preserve the function and stability of the joint. Splinting describes any method used to keep the injured hand or finger from moving. The doctor may place an injured hand or finger against a solid, stiff object but not inside a cast. With a splint the injured area is immobilized yet still has room to swell. A cast does not allow for swelling, so the injury may be casted a few days after swelling has decreased. Buddy taping is a procedure where the doctor tapes an injured finger to an adjacent finger to keep the injured finger from moving. The other finger becomes a splint. Referral for operative repair or acute reduction; some patients will require conscious sedation (anesthesia technique where the patient is not fully sedated, but does not require ventilation assistance). Fractures of the hand and wrist are fairly common. Most fractures heal well if treated in a timely and appropriate manner. Some injuries may require a series of X-rays over one to two weeks. 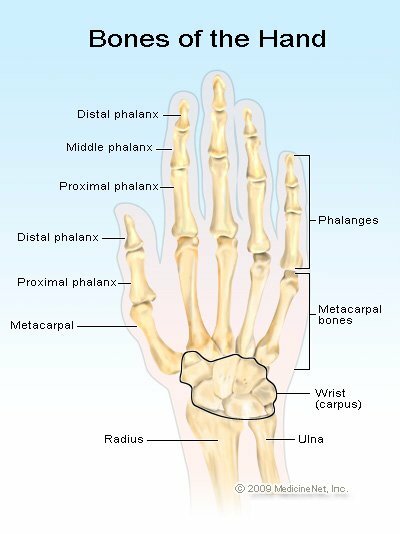 The small bones and complex structure of the hand make some fractures difficult to detect. The treatment of fractures depends on a number of factors including the severity of the crack or break, whether joints are involved, the location of the specific bone injured, the amount of deformity (displacement), and if there is a laceration (cut) associated with the fracture. Children's bones are still growing and so are susceptible to fractures involving the soft areas where the bone growth is actually occurring (growth plate). Some of these growth plate injuries are difficult to diagnose because they do not show up on X-rays. Injuries near the growth plate areas of a child's hand therefore may need to be treated as fractures (breaks) even with normal X-rays. Some doctors will X-ray the opposite uninjured hand to compare with the injured hand to assist with visualizing growth plate fractures or disruptions. Treatment of a recent fracture rarely includes an enclosed cast. Fractures and other injuries that require immobilization are often splinted on one side to prevent compression injuries from a cast that covers the entire hand. A splint allows room for the swelling associated with acute injuries, which may prevent the loss of adequate circulation or nerve injury. Splinting does not entirely eliminate the possibility of this complication. Anyone who experiences numbness, color change, or the feeling of tightness after splint application should return to the doctor immediately or go to the emergency department. Stabilize the injured person first, and then if possible, preserve amputated body part. These injuries can be devastating to the hand and the patient. Reattaching (replantation) is difficult, and even if successful may, cause long-term complications with pain and infection. Situations when a surgeon may attempt replantation are amputation involving a child, thumb amputation, or amputation of multiple fingers or the entire hand. Crush or tear injuries and prolonged delay before evaluation may make successful replantation impossible. Each injury requires an immediate evaluation because each person's circumstances warrant all possibilities to be considered. The type, location, extent, person's wishes, and time of injury all contribute to the treatment plan. Some injuries will require immediate surgery for replantation. Others will require little medical intervention beyond cleansing, bandaging, and allowing the injury to heal. In some locations, the doctors and facilities needed for replantation do not exist. Fingertip and nail infections may be treated in the clinic or emergency department with incision and drainage (if indicated), antibiotics, and close follow-up. A major consideration for an infection in the hand is the presence of a fluid collection or an abscess. If the infection is isolated to the skin, known as cellulitis, treatment involves antibiotics and close follow-up. However, an abscess requires drainage (sometimes known as "lancing"). If the abscess is large or near nerves, arteries, ligaments, or tendons surgery may be necessary for treatment. Hand infections have the potential for rapid progression leading to severe loss of function. Serious burn injuries to the hand may require an evaluation by a hand or burn surgeon. Hospital admission may be required for treatment. Multiple operations including skin grafting may be needed in order to ensure the best outcome. Referral to a doctor skilled in burn treatment for evaluation and debridement within 24-48 hours of injury (debridement is the process of removing dirt, foreign bodies, and dead tissue from a wound; this procedure could involve washing, scrubbing, and cutting away of dead tissue). Some patients, especially those with burns that completely surround the fingers, hand, or wrist, may be admitted to a hospital burn unit because of the potential to develop compartment syndrome. Certain exposures require immediate debridement. In some burns, water is not used because it further damages the skin, other exposures require systemic treatments so a specialist in burns is good to consult; in addition, the poison control center (1-800-222-1222) can help decide what special emergency treatments may help with certain patients. After the initial evaluation and treatment, almost all hand injuries will require close follow-up with a hand specialist and a primary care doctor. Most injuries will need to be checked within one week after the first evaluation and treatment. Some injuries may require a series of office visits or interventions (with tendon lacerations, infections, fractures, second- or third-degree burns) to achieve complete healing while others (simple or shallow cuts, first-degree burns, small fingertip amputations) may only require one or no follow-up visits. The use of appropriate safety equipment during sports and occupational activities could prevent or limit the extent of fractures, dislocations, cuts, and burns. Normal household safety measures, especially with small children, will also decrease the chances of all injuries, including those to the hands. The key to decreasing the long-term effect of a hand injury is timely medical evaluation and treatment. Most hand injuries will heal without significant loss of function if evaluated by a doctor soon after the injury. Almost all hand injuries require a medical evaluation because even the most insignificant hand injuries have the potential for serious or crippling loss of function. Many factors will play a role in determining how well the injury heals with the least limitation of function. As an emergency room physician, I frequently see hand injuries. I injured my hand when I was 18 years old, and since then I have taken a special interest in treating hand injuries. While working in a restaurant I accidentally stuck my index finger into a mechanical cheese grating machine and ground off the tip of my finger. I suffered traumatic nail bed damage, an open fracture, and tendon injury to the dorsum (back side) of my finger. I went directly to the local emergency department where I was seen by a resident physician who took some X-rays and then prepared to repair the extensive lacerations. During the procedure the doctor injected lidocaine (a common local anesthetic) directly into the area surrounding my wounds to anesthetize my finger, which was incredibly painful - more painful than the initial injury. The doctor put in several stitches to stop the bleeding and bandaged my finger with a splint. I was referred to a hand surgeon for follow-up the next day. MedscapeReference.com. Soft Tissue Hand Injury Differential Diagnoses. WebMD.com. Finger, Hand, and Wrist Injuries.